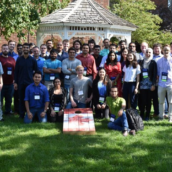 The IEEE Canada Student Congress is an annual leadership workshop that has been held for at least the last 20 years for student branch leaders across Canada. Attendees will learn about the operational knowledge of IEEE as well as the tools, resources, and best practices recommended in order to run an IEEE Student Branch and deliver fulfilling experiences to their membership. In addition, attendees will be able to network with committee members and volunteers from other IEEE Student Branch and IEEE organizations to share and learn about leading IEEE committees, events, and initiatives. Funding from IEEE Canada is provided for accommodations and travel for ONE leader from each college/university student branch for up to $700 CAD. Additional funding may be available for new Counselors to attend. Additional student branch leaders may attend if supported externally (e.g. with branch, section, or institutional funds) and if hotel space is available. Posted by Irusha Vidanamadura on 2019-02-03 at 13:24 in News.